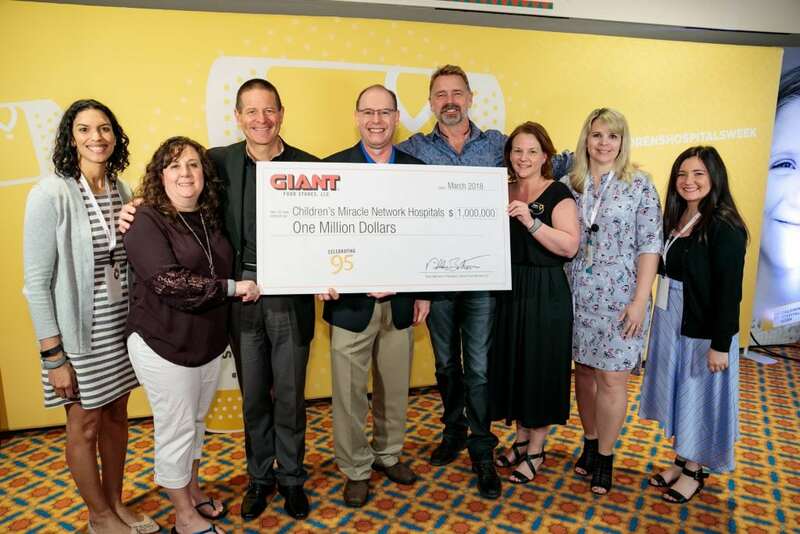 Salt Lake City, UT (March 13, 2018) —GIANT Food Stores announced a $1 million donation divided between three local Children’s Miracle Network Hospitals partners in the form of grants awarded during Children’s Hospitals Week in Orlando, FL last week. The donation is part of GIANT Food Store’s 95th anniversary celebration, with events happening throughout 2018. The grants have been awarded to Children’s Hospital of Philadelphia ($570,000), Penn State Children’s Hospital Hershey ($280,000) and Geisinger Medical Center ($150,000) and will be used for specific needs as identified by each hospital. These include support for the Child Advocacy Center at Geisinger Janet Weis Children’s Hospital so that 100% of children referred to the center will receive coordinated forensic interviews, victim advocacy and mental health services as appropriate. The GIANT Food Stores Welcome Desk at Children’s Hospital of Philadelphia (CHOP) will welcome 10,000 patients from nine specialty programs during the day and 12,225 urgent care visits on nights and weekends. This gift will enhance the patient and family experience at all three urgent care sites, helping CHOP plan for the unplanned. Penn State Children’s Hospital will receive support for 3D printing and modeling for congenital heart disease. In addition to enhanced clinical care for patients and ongoing clinical research, the use of 3D printed cardiac models will also assist medical students and residents in their education about congenital heart disease. The announcement was made during Children’s Miracle Network Hospitals’ Live-A-Thon on March 8 hosted by Stephen tWitch Boss, Allison Holker, and other celebrity guests. In addition to the annual balloon and candle in-store campaigns held during the summer and at the holidays, associates also regularly volunteer at CMN Hospitals events, including radio and television telethons. Since 1997, GIANT Food Stores has raised more than $42 million for Children’s Miracle Network Hospitals. For more information visit www.giantfoodstores.com. GIANT Food Stores, LLC has more than 170 neighborhood stores and offers home delivery, online/mobile ordering, fuel centers, pharmacies, plus in-store nutritionists. Serving families in Pennsylvania, Maryland, Virginia and West Virginia, GIANT Food Stores is proud to employ more than 30,000 associates who believe in giving back to their community. Founded in 1923 in Carlisle, Pennsylvania, GIANT Food Stores is a company of Ahold Delhaize. For more information visit the GIANT or MARTIN’S websites. Children’s Miracle Network Hospitals® raises funds and awareness for 170 member hospitals that provide 32 million treatments each year to kids across the U.S. and Canada. Donations stay local to fund critical treatments and healthcare services, pediatric medical equipment and charitable care. Since 1983, Children’s Miracle Network Hospitals has raised more than $5 billion, most of it $1 at a time through the charity’s Miracle Balloon icon. Its various fundraising partners and programs support the nonprofit’s mission to save and improve the lives of as many children as possible. Find out why children’s hospitals need community support, identify your member hospital and learn how you can Put Your Money Where the Miracles Are, at http://www.CMNHospitals.org and http://www.facebook.com/CMNHospitals.